A plug developed by Taco Comfort Solutions that learns user habits and makes hot water systems more efficient has been named 2017 Product of the Year at this year’s AHR Expo in Las Vegas, officials said. 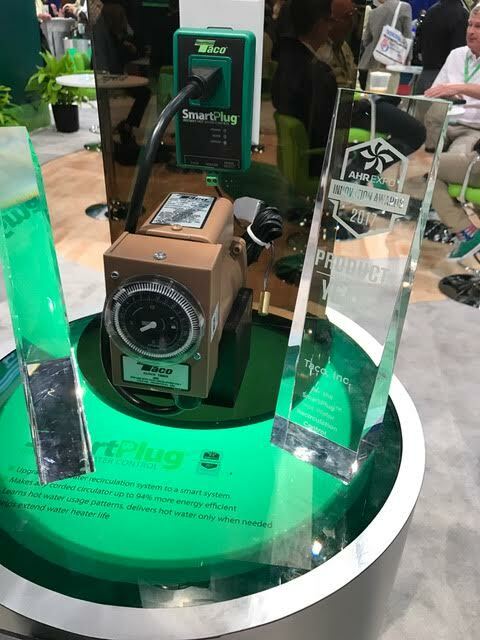 The SmartPlug was chosen over a host of other heating, air conditioning, ventilation and refrigeration solutions that previous were recognized as AHR Innovation Award-winners. “Winning an AHR Expo Innovation Award is a great achievement,” said Wil VandeWiel, president and CEO of Taco, Inc. “The winning products in all the categories will define the markets in the next decade, where innovation, sustainability and energy management will be key drivers. The SmartPlug Instant Hot Water Control is a hot water recirculating system that can save thousands of gallons of water a year by making any corded circulator up to 94 percent more energy efficient by learning hot water usage patterns and delivering hot water when it’s needed. The plug eliminates tanks from running continuously and assists improperly programmed timers that can waste energy by operating the circulator and hot water heater at times when hot water isn’t needed. This increases hot water comfort, reduces energy use and helps extend the life of the hot water heater. Installation of the plug requires no programming, timers or aquastats are required. SmartPlug is simply plugged into a 110V outlet, then the circulator power cord plugged into the SmartPlug. Using a sensor that mounts to the hot water supply pipe, the SmartPlug will learn the daily hot water usage pattern in a home or building and adjust the circulator run time automatically to deliver hot water when it’s needed. When usage patterns change, the SmartPlug adjusts run time automatically. The SmartPlug also includes a pulse mode option that continuously cycles the circulator on for five minutes, then off for 10 minutes, as well as a vacation mode that shuts the circulator off after 36 hours of no hot water use. While in vacation mode, the SmartPlug’s exercise function will cycle the pump for 10 seconds every seven days to prevent corrosion or scale build up.